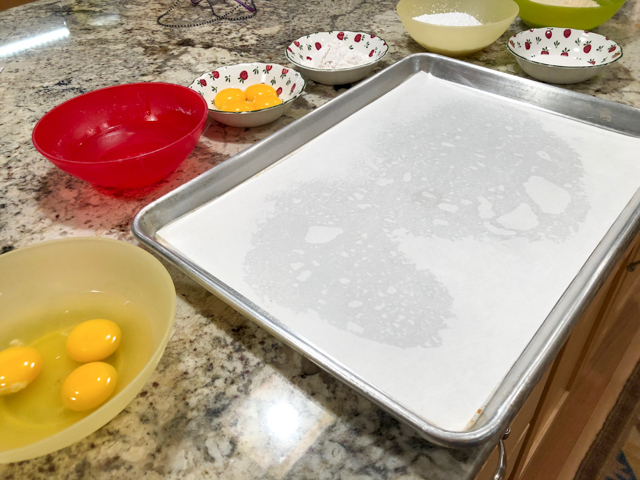 Make the cake: heat the oven to 350 F. Line a baking sheet with parchment paper or a silicone mat. Place a 8 in x 8 in square frame on top. Sift flour and powdered sugar together. Reserve. In the large bowl of the mixer, using the wire whisk, beat the egg whites until they begin to froth. Add the cream of tartar and a pinch of salt. Gradually add sugar and vanilla sugar. Continue to beat until firm peaks form. Turn off the mixer. Sieve the flour with the powdered sugar again on top of the beaten egg whites. With the help of a silicone spatula, gently mix the batter. Transfer the batter to the prepared ring, smooth the surface. Bake for about 35-40 minutes until the cake is lightly golden and a toothpick inserted in the center of the cake comes out clean. Remove from the oven and allow to cool in the ring. Remove the ring, and if you like, shave the sides to show the white crumb. Make the raspberry confit: In a pan, heat the puree with half the sugar until it reaches 104 F (about 40 C). Add the rest of the sugar mixed with the pectin. Cook for 1 minute, stirring constantly. Remove from heat, transfer to another container, cover with plastic film touching the surface, let it cool to room temperature then place in the fridge. Make the mousseline: In a small saucepan, combine the sugar, vanilla sugar, cornstarch and flour. Stir well with a wire whisk. Add the milk and the raspberry puree stirring constantly. Add the egg and incorporate well. Heat the mixture for about 5 minutes, until the cream thickens, and the temperature reaches about 180 F. Remove from heat, transfer to another container and cover with plastic film touching the surface. Allow to cool to room temperature, place in the fridge. Thirty minutes before making the mousseline, remove the cream from the fridge. Beat the butter until creamy. Gradually add the cream (it is important that the cream and butter have the same temperature), continuing to beat until you get a fluffy cream. Transfer the cream to a confectioner’s bag with a 1M tip or another tip of your choice. 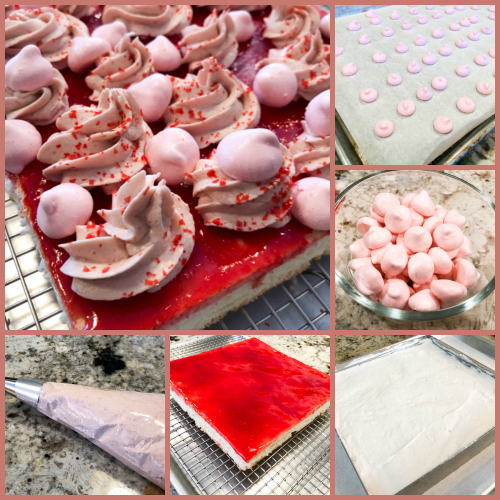 Make the mini-meringues: Heat the oven to 185 F. Line a tray with parchment paper or silicone mat. In a large bowl, beat the egg whites until firm, but do not let them dry. Slowly, add the sugar and beat at the top speed until it has dissolved. Reduce the speed to the minimum and gradually add the powdered sugar and the pink food dye. With a piping bag fitted with a round tip, pipe very small meringues in the prepared tray, and bake for about 2 hours or until they are dry and crunchy. Turn off the oven and let the meringues cool inside. Assemble the cake: Apply a thin layer of confit to the top of the cake. Then, with the help of the pastry bag, spread the mousseline cream on top. 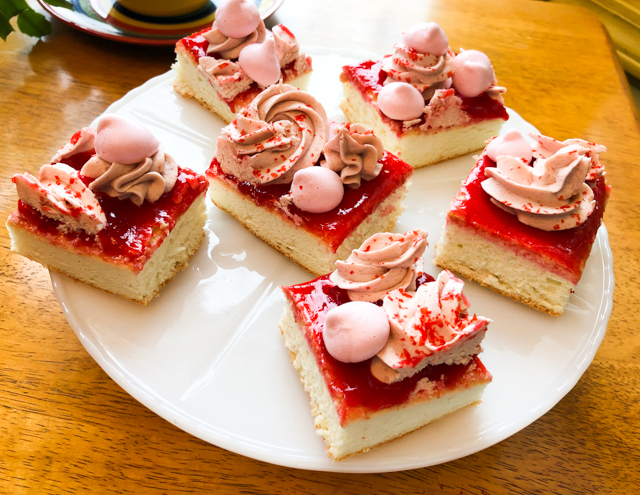 Decorate with the mini-meringues, and sprinkles of your choice. Cut in squares and serve. Comments: This was my first time making Angel Food Cake, one of Phil’s favorite cakes. Ever since I met him he talks about his Grandma’s Angel Food Cake with a particular type of frosting that as far as I can tell might be a boiled frosting known as Ermine. Obviously, I have a mental block about baking that cake, how could I compete with sweet childhood memories? But perhaps this little adventure into angelic territory will give me a bit more confidence. 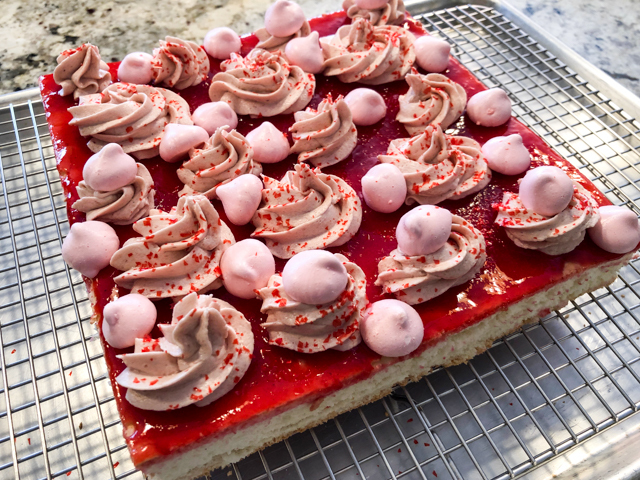 I made the cake and the mini-meringues on a Saturday, and also prepared the raspberry puree (sieving that stuff is not something I look forward to), reserving everything in the fridge. Sunday was dedicated to making the confit and raspberry mousseline (mousseline-virgin here). There were moments of drama, as so often happens when Sally bakes cake. Mousseline: I was very careful monitoring the temperature of butter and raspberry custard component, I swear they were similar but still the whole mass turned grainy right in front of my eyes. I checked what time it was in Moscow – middle of the night. What would be the chances that Miúda suffers from chronic insomnia and checks her blog at 1:55am? Not very high, I’d say less than 5%. So, I took matters in my own desperate hands, and grabbed my personal life-saving device, the hair-dryer. Warmed up the side of the bowl, continued beating and sweating (from nerves, not the hair-dryer thing), and then, all of a sudden, I had the most beautiful mousseline ever seen in Manhattan, KS. My sense of relief was palpable. I really loved how all the components worked together in this dessert. The angel food is a kind of a humble cake, with unique smooth texture but not much in the flavor department. The raspberry confit is quite the opposite, it’s all about flavor, hitting you intensely with the tart-sweetness of the fruit. Then it all gets mellowed down by the mousseline cream. The mini-meringues surprised me because at first I thought about skipping them, but they give this dessert an additional crunchy texture that is pure joy. If you make this cake, bake a batch of meringues, you will be glad you did. It all starts with the mis-en-place for a Joconde sponge cake. With a name like that, you know it’s going to be special. Joconde is a cake leavened exclusively by beaten eggs, with a nice proportion of ground almonds (or almond meal) in the batter. 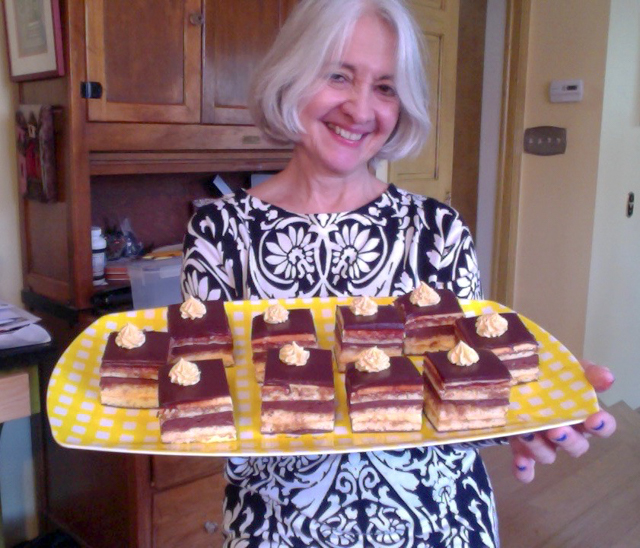 Colette gives very nice tips to make it homogeneous in thickness, because the Opera Cake is all about precision. Any small mistake in a step, and the outcome might suffer. You can use any formula you like for the cake, I will give you one example from BBC food, very similar to the one I used from Colette. Almonds and icing sugar are sifted into a large bowl, eggs added and whisked to combine. A meringue is made with the egg whites, raining the granulated sugar slowly, until soft peaks form. Increase the speed to medium-high, and mix until the whites are at a firm peak. Add 1/3 of the meringue to the almond mixture. Add half the cake flour and half the melted butter. Add another 1/3 of meringue, the rest of the flour and butter. Finally fold in the remaining third of the meringue. 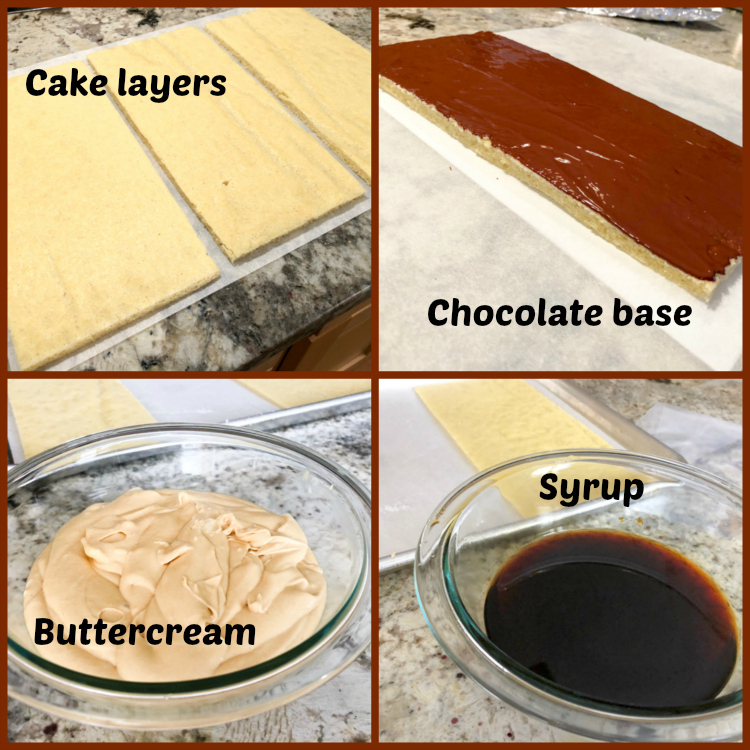 Spread the batter as homogeneously as possible on a half-sheet pan. Try not to deflate it and bake it right away for about 15 minutes at 375 F. The cake should not get any color, but it should spring back lightly when touched at the center. 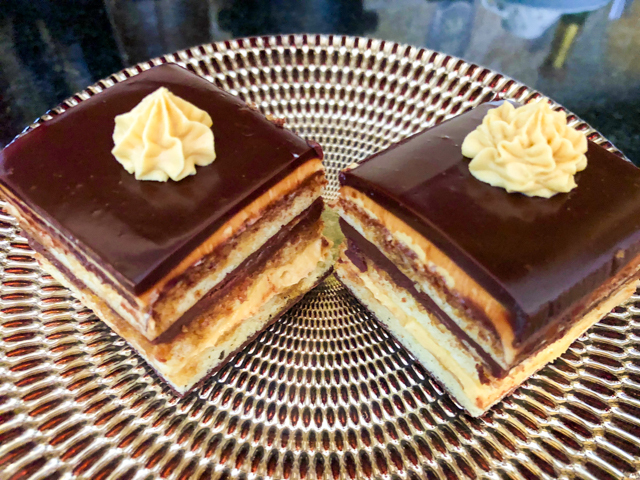 After baking, the cake is cut in three rectangles. Try to be precise, but don’t worry too much, as the cake will be trimmed at the very end. One layer is painted with melted chocolate and allowed to set. That layer of chocolate will be the very base of the final cake, preventing any soaking syrup from forming a puddle in the bottom. 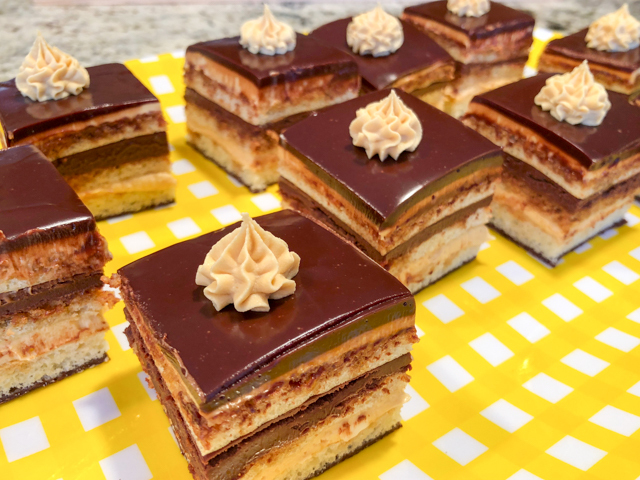 You will also need to make a coffee buttercream, more specifically a French buttercream, in which a mixture of sugar and water is cooked to 236 to 240 F (soft-ball stage). You can use this recipe, which is again very similar to the one I got from Craftsy. Just include 1 tablespoon of coffee extract together with 1 teaspoon of vanilla extract. You need coffee extract to make sure the flavor will come through without diluting the buttercream too much and affecting texture. 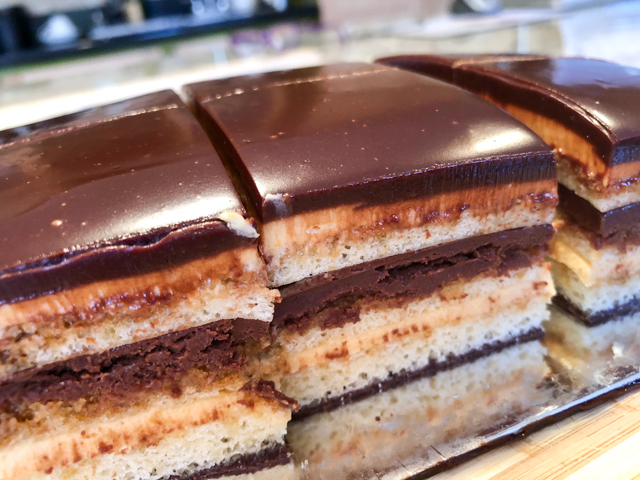 Apart from the buttercream, you’ll need chocolate ganache for one of the cake layers. A regular kind, equal weights of chocolate and heavy cream, allowed to cool to room temperature and placed in a piping bag. 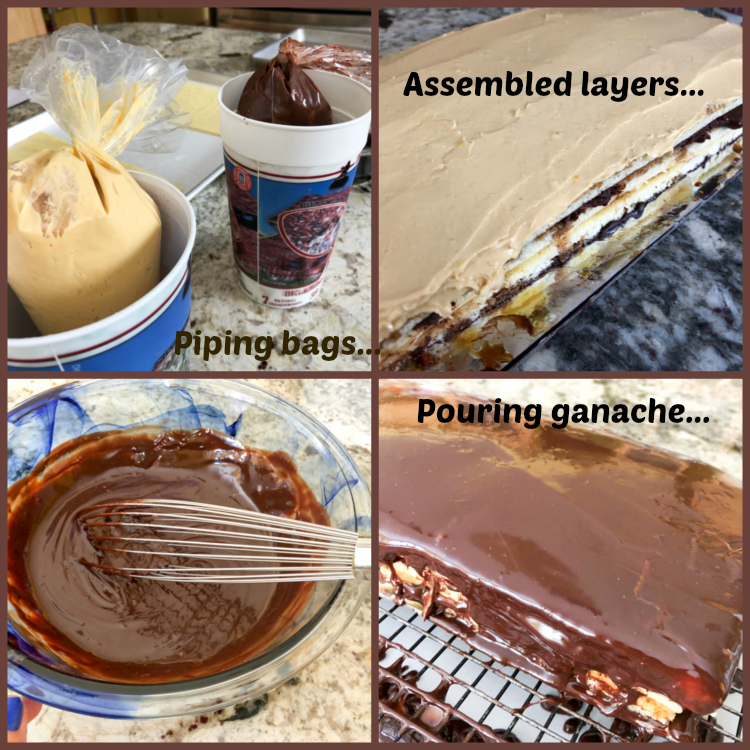 The buttercream also goes in a piping bag, the easiest and less messy way to assemble the cake. No need to use a piping tip, just cut the bag to form a 1/2 inch opening. 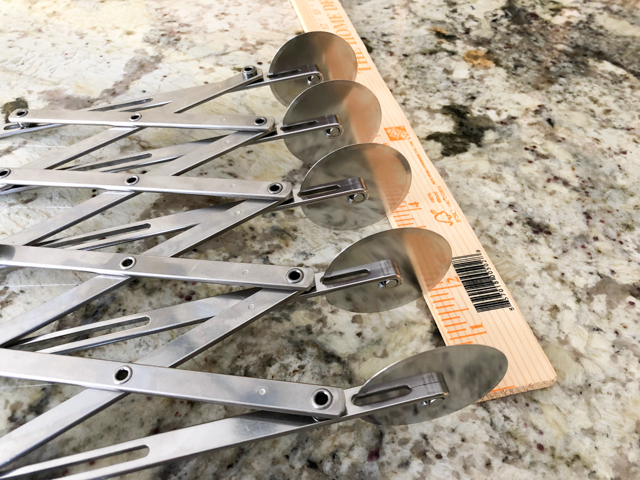 I also used this tool to cut the laminated dough for croissants and pain au chocolat, but failed to get a picture at the time. 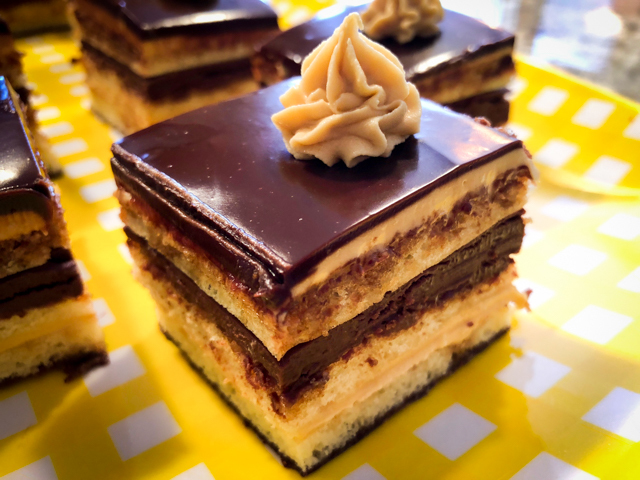 All you need to do is measure the precise dimension of what you want to cut (or score the surface, as in the case of the Opera Cake), and lock the rolling blades in place. Gently roll them over the surface of the fully set cake, and you will have perfect squares, ready to be sliced with a serrated knife. The edges are trimmed off to reveal clean layers on all sides of the cut pieces. The secret is to place the knife in very hot tap water, and clean the blade after every cut you make. If you’d like to order one, here is a link to amazon.com (I do not make any profit from your purchase, by the way). A little buttercream goes in a small piping bag couple with a star tip. And you are ready to decorate the top. 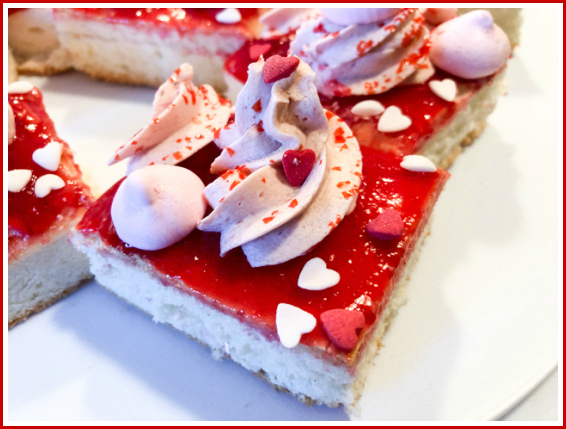 Or, you can do the more authentic decoration, writing Opera on each slice. Since I opted to cut the cake small, I went with the buttercream instead. What do you think? This cake was so much fun to make! I started early on a Sunday morning, and tried to work as relaxed as possible. It is cake, after all, and they make me a little nervous. But, less now than in the past.